Goats milk for dogs? Yes! And if you are looking for a healthy “milkshake” to feed to your dog and something that you can enjoy also, then we have just the thing for you. So why goats milk and not regular cows milk? Well it seems that goat’s milk is a lot healthier for us and our pups. According to the Journal of American Medicine, “Goat milk is the most complete food known.” It contains vitamins, minerals, electrolytes, trace elements, enzymes, protein, and fatty acids. In fact, the body can digest goat’s milk in 20 minutes. Raw Goats Milk is great for your dog! As it contains vitamins, minerals, enzymes & fatty acids. Also goats milk is easier to digest as cows milk contains alpha-s1-casein protein. This protein may play a critical role in people and pets being allergic or sensitive to regular cows milk as goats milk may have little or no amount of this protein. In addition, raw goats milk, such as Primal Pet Food Raw Goat Milk (pets only) is high in the enzyme lactase, which allows the breakdown of lactose, a milk sugar . Pasteurization and heat destroy this precious enzyme making it hard for people and dogs to digest regular milk easily. Please note though that if you are unable to purchase raw goats milk, the pasteurized commercial goats milk (as seen in the pic below) still has less lactose than cows milk, and easier for dogs to digest. For this recipe I used ingredients from my local Whole Foods Market so we could both enjoy the shake. When purchasing products I try to purchase from those items that are produced locally. Ideally within 150 mile range, but sometimes that is not always possible. The milk is from Summer Hill Goat Dairy that is within a 50 miles from me and Redwood Hill Farms produced the yogurt which is about 24o miles from us, but still in California. 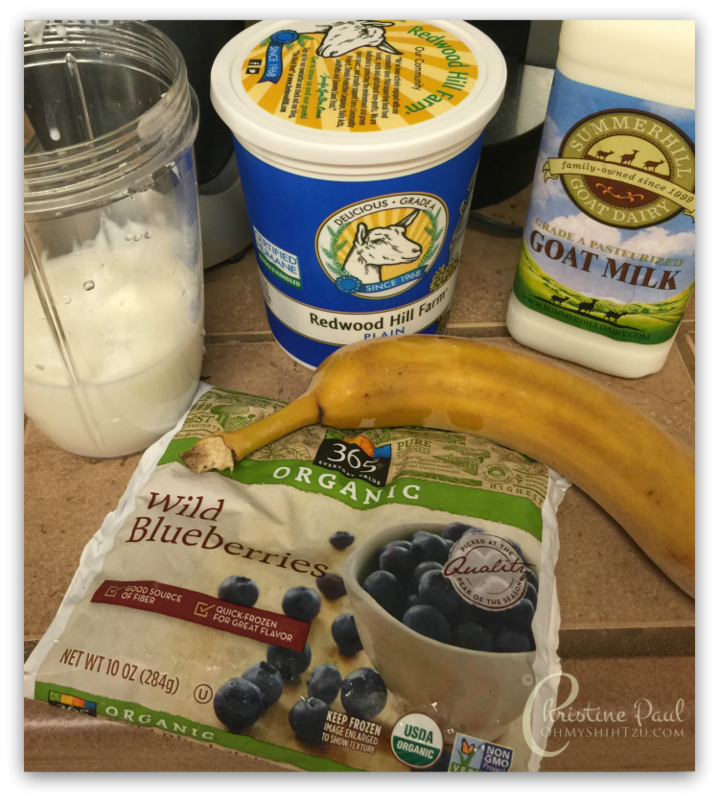 Place all ingredients into blender or smoothie machine, blend until smooth. Serve! Since all my girls are under 20 pounds, I give approximately 1/4 cup per serving to each pet. Thanks for stopping by today! We will be reviewing the yummy Himalayan Dog Chews Yaky Charms next Tuesday, as they were a big hit for our girls during the Super Bowl. Today we are joining Sugar the Golden Retriever & Kol’s Notes for Tasty Tuesday. « We Will Always be Seahawks 12! I’ve yet to try goat’s milk, myself, but this sounds yummy. 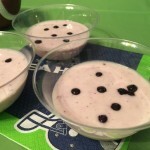 My Delia loves goat’s milk and we both like blueberries and bananas, so this is something we’ll definitely try together. It sounds good, I’m just hesitant to try goat’s milk and I can’t tell you why. I have been making myself a shake every morning and I use a mix of berries, bananas, spinach and almond milk. It’s very good. Sometimes I let the dogs lick the glass, but I would definitely be able to make them their own smoothies. Do you know if the goat’s milk is better than Kefir in terms of probiotics? 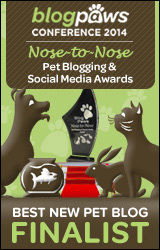 I’ll definitely be pinning this because I can tell you, my dogs will go NUTS over this! Nike adores bananas, and she’s a pretty big fan of blueberries too, so this is right up her alley! Thanks for sharing! Wow! This looks sooooo good! I would slurp it up in a second! This recipe looks & sounds delicious ~ we’ve never tried goat’s milk, but may just give it a shot!! What a great recipe! Love making things that both Luna and I can enjoy. Hmm, interesting! They look very tasty. May have to give it a try! Looks yummy, we’ve never had a smoothie before! Yum! !